So you are a bandit and stole a ship with all it's treasure. HAHAHA DID YOU THINK IT WOULD BE THAT EASY? Play the epic ship warfare! Fire yer canons! Kill those pesky pirates! Edited by CrazyGuyGames, 07 September 2014 - 01:32 PM. Fun game. I like the graphical style here. Sort of pixelated, but cartoony at the same time. And it looks good in either windowed or full-screen mode. The animations are pretty nice too -- I even jumped in the water a few times. Nice splash. Little things like that show good attention to detail, which I like. The controls seemed to work OK, and my character sprite changed appropriately. But I couldn't seem to engage the enemy very well. That's probably just me being a klutz, so I'll try this again later. As I warned, I'm now about to brutally mutilate your game with my review. Or not. The first game I'll be reviewing today, and maybe the last, depending on how much time I manage to find. 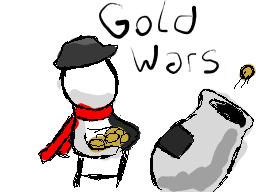 Said game is called rather deceptively "Gold Wars", even though you will see that there is way more wood, sea or stripes than gold. Especially stripes. HAHA DID HE THOUGHT THINK IT WOULD BE THAT EASY? ...to be attacked by rightful owners of the treasure, if by "rightful owners" we mean those who robbed even more rightful owners from it. The epic ship battle is about to begin! Just before that, I check the tutorial; merely switching to "tutorial" menu option causes it to be shown in all its glory. Not knowing how to leave the tutorial, I accidentally exit the game (it later turned out you need to press up or down arrow button). ^^"
The actual gameplay involves attacking pirates, jumping on planks and throwing various items into cannonballs to attack enemy ship. All that with rather nice visuals and sounds giving retro feel and adventurous soundtrack in background (of course, I haven't found a way to turn it off...). It worked rather well - I generally, enjoyed the game, though quickly found that the best working strategy is eliminating the pirate crew (leaving the captain), and then play two-sided volleyball, except with cannon instead of volley (specifically: shooting the cannonball on enemy ship, and then try to grab it for another launch until captain reaches it; after enough successful iterations your ship has more health than enemy's). Eventually, I managed to sink the enemy's ship while keeping all the gold. Yay, I've got bragging rights! As for things I disliked, I couldn't really see if my attacks affected the pirates, and if so, to what extent (I still don't know if captain can be killed or not). Also, jump option seems like unnecessary violation of handicap; it adds the third dimension to gameplay, though I used it only for getting on planks and wouldn't mind it gone entirely. Nonetheless, those are rather details, and they don't change the fact "Gold Wars" was one of more interesting entries I got to play so far. Too bad it has only got one level, and yet it's hard to tell how the other ones should look like. ^^"
Use of Handicap: Heavily corrupted by having jump and cannon launching, adding the Z dimension to the game. Devblog: List of events, not that fascinating to me... ^^"
In hindsight, I guess that whole RTP/RTCP thing didn't annoy me *that* much. ^^"
Hahahaha yeah my game was brutally disected by your review. But I like it, it was just how a normal game would be reviewed (By normal I mean made with all the time in the world). Also my bad for the bad grammar, english is not my primary language I'll change it when jam finished, thanks for pointing it out!. Hey thanks for trying my game, glad you liked it ! You're welcome. I generally seem to review games from regular player's perspective, whether it's intended or not. ^^"
As for grammar/language and such; one thing I noticed in game itself was "comming" instead of "coming". Since you seem to want to develop the game further, I guess you'd like to know about that. I wasn't really enjoying the game at first, then I restarted and got the feel of it. Gameplay is quite fast, which is refreshing. I found the fighting was a bit difficult to use so I ended up just running away and loading cannon balls to destroy the enemy ship. Which led me to finding an awesome little Easter egg, the parrot. Haha shot the bird sky high with one of the cannons. All in all, fun to play. Good work. First - this is a very good game. The graphics are well-done, although the use of jumping makes this a 2.5D game, thus not completely following the handicap. The music is awesome, too. One of the things I really like with this game is the level of freedom you have. You can run around on your ship, or the enemy's, without being forced to do anything special. Yet, it's not a massive world where you don't have a clue of where to go. This game needs a better tutorial. It's not enough with just telling the controls, it took a while until I figured everything out. Put some work into making a proper, interactive tutorial stage. Expand it. It's simply too short, and not enough you can do. Make more levels. Pirates don't only protect their own gold. They steal others. Yarrr, put gold on the enemy ship to steal! You could also allow to find other useful items on the enemy ship: health packs, weapons, etc. Seriously, that intro is dull and ugly. That gives a bad first impression. Maybe a little more action? Basically all you do now is putting stuff in cannons. Make enemies board the ship occasionally (not only in the beginning). You can consider improving the fighting system a little, allowing you to parry enemies attacks, etc. Don't make the game quit immediately just because you press the Esc key. I hate that, and it's unprofessional. There's a bug allowing you to walk through the north walls on the cabins. Final note: This game is already a good jam game, and has potential to become a good indie game. This was a fun little game. I liked how you can pick up anything and fire it across. I was shooting all my gold at them, even the treasure box. The music was a good choice.